I always look forward to celebrating the Fourth of July! Don’t get me wrong, I adore the frenzied holiday season that comes later in the year, but partying in a laid-back summer fashion is nice change of pace. My favorite way to make this holiday a casual affair is by mixing and matching china patterns. I also love adding greenery from my garden to the table for a lively and fresh look. A tablescape is really quite simple to throw together. It’s something you can set out the day before, which makes any gathering come together in a snap. And the best part about this tablescape in particular? No rules! I’m fond of blue calico, but swap patterns and linens to your heart’s content—that’s what makes it fun! I hope this tutorial from Southern Lady magazine serves as a guide to turn your table into a fabulous canvas for a delicious summer spread. Happy Fourth, friends! To see more mixing and matching ideas, like the featured image above, visit the Southern Lady website here. I’d love to know: How are you celebrating the Fourth of July this year? 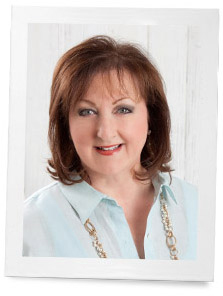 Find more marvelous inspiration in our July/August issue of Southern Lady! Gorgeous tablecloth and napkins. I love your blue vases from your grandmother! Thank you for a lovely video. 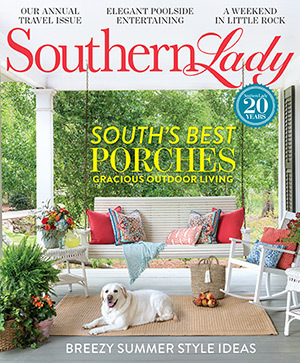 I can’t find the Southern Lady magazine! Can you tell me where I can get it? Hi, Kathy! Below is a link to the Hoffman Media Store where you can purchase any of our issues, old or new! You can also find our newest issues on newsstands. Thank you for reading! I love your table setting. My table, too, is decorated in the red, white, and blue. The 4th is my favorite holiday, in part due to the fact it is also my birthday. Love the video! Wishing you and your family a very Happy July 4th! Out tablecloth is red,white and blue as are the potholders, towels and other accessories. We have decorated plates and napkins,too. We always make jell-o cherry,strawberry or cranberry. It wouldn’t be July 4th without watching the Macy’s fireworks display. The house is always festive,too. We have vases full of red,white and blue flowers. We always decorate the house and use many of the Bi-Centennial decorations. I just have to say and I am sure so many others agree, I truly do love reading , viewing your site. I feel so inspired for everything lady like and special. Now if I was truly southern with an accent, it would be perfect! Thank you for brightening our days! We will be celebrating the 4th of July at home with friends coming to dinner. I will be serving pasties (a meat,potato & onions in pastie crust) with salad and a cherry angel food cake. Pasties originated in Cornwall, England and the the French Canadians brought it to the UP of Michigan. Every year in the Park in my hometown in MI, we had pasties like you would have hamburgers and hot dogs. So, I like to invite my friends here in Florida to enjoy a pastie and they really love them. Also, I decorate my table in red, white and blue and everyone tells stories of how they spent 4th of July as a child which is always so much fun. Our community celebrates Fireworks on June 30th so we will be attending after dinner. I love this video, thank you for the tutorial! So nice to see you in “person” Phyllis. Our travel plans for the 4th have changed due to our son’s baseball teams game wins. Staying in town as we move to the next level but I will certainly plan a nice table after seeing this! What is more all American than baseball and hot dogs! I think I will check out the Sam fink book for my kids that is mentioned above too. Great idea to teach and instill our countries founding beliefs to our children. Thank you! Oh Susan I wish I had one your pasties. I have them in Williamsburg when I travel there, but I know yours are so much better!!! Like you, my table is set with a July 4th theme. For the day it will be set for our traditional crab boil. This year I found a blue and white striped tablecloth to start. On top of that at each place I have huge round or rectangular platters with patriotic markings so there will be plenty of room for crabs, shrimp, etc. I put everything in a huge flat wicker basket in the middle of each table so everyone can reach it. At each plate, an enormous bar cloth is used as a napkin and all the utensils needed, including a crab cracker. I have metal buckets trimmed in red towards the end of each table for completed claws. After our crab boil we have strawberry shortcake made using biscuits and then we sit around in the great room and pass around for each person to read a two page spread of Sam Fink’s wonderful Declaration of Independence book. Using the committee of five, he has illustrated each phrase of the Declaration on one side and the phrase is on the other page side. We’ve had little kids being helped to read at age 5 to 95 year old grandmothers reading a phrase over the many years we’ve had this tradition. If you don’t already do something like this, begin to at least read the Declaration aloud during your family gathering. We must never forget how many bled and died and lost everything when these men swore and signed away their lives, their fortunes, and their sacred honor. Sam Fink’s sounds wonderful, I will look into it. Thank you so much for sharing. Thank you Phyllis! I love how you mix and match treasured pieces to create a lovely table. I am inspired to go through my collection of family linens to see what would work for the Fourth. Thank you for making the video – I too love blue and white for the table, and it is a simple thing to add another color to make it festive. I am now 80 and still love the 4th of July! But my poor cat is terrified and I keep her in so she can hide under the bed while all the noise is going on. Our weather here in central California has been hot and the grass has turned from green to golden brown, so fire is always a concern. I try to keep in mind the terrible conditions our forefathers fought through to gain our freedom from English rule and am grateful every day that we are still free. Aren’t we a lucky nation! I love the tutorial. My family will be at my home and I will set a red, white, and blue table with a mix of patterns. We always have grilled burgers and hot dogs with side dishes and finish with a freezer of home-made vanilla ice cream with an assortment of toppings. Happy 4th to you and yours! I love the ideas and the colours…my favourite for summertime. Here in Canada we celebrate Canada’s birthday on July 1st so I have lots of red and white, with a maple leaf motif sprinkled throughout. 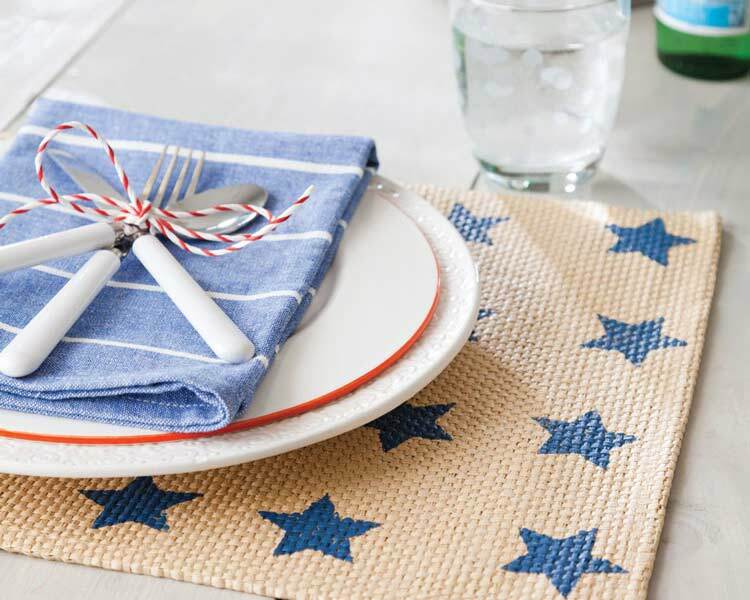 And since I do have some American heritage, on July 4th I switch some things out and of course add blue to my decorations, everything from napkins to banners and even red, white and blue candy. Happy celebrating to everyone! Love to set a pretty table. This year a friend and my husband and I will go to the parade in Niwot, a neighboring town. We will return to our home and have a leisurely lunch on the porch that will probably last into the late evening. Brats, potato salad and old fashioned green beans cooked with a ham hock will be our meal. Beer for the guys and ice tea for me. Strawberry Cobbler with vanilla bean ice cream will end the day. Happy Independance a Day Phyllis. Hi Phyllis, Thank you for the tutorial; very pretty. We have a busy day planned for the 4th. Our daughter and family will be in town. We will go to our neighborhood parade that we can walk just a few houses up the street to view. We’ll have a bit of brunch then travel about a half hour away to our friend’s Lake Erie cottage for his annual 4th of July picnic (potluck). We will see old friends, meet some new people, and enjoy community. It’s a very traditional enjoy. Have a wonderful Independence Day and summer!! Love this tutorial, it’s always exciting to set a pretty stage for a gathering of the people you love! Happy 4th!